On Christmas Day, General Edward Pakenham arrived on the battlefield with his second in command Major Samuel Gibbs and 3,000 troops. Adverse winds delayed their arrival in Jamaica. His arrival greatly cheered up the men. 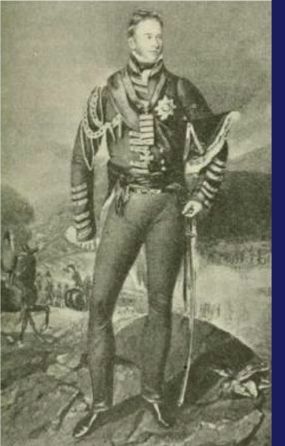 General Pakenham, the brother-in-law of the Duke of Wellington, a favorite of the Duke and of the army, was of North of Ireland extraction, like the antagonist with whom he had come to contend. Few soldiers of the Peninsular war had won such high and rapid distinction as he, such as at Salamanca and Badajoz. Pakenham was shocked to find the very unfavorable position the British were in and that the army had not advanced into New Orleans on the 23rd. During a staff meeting, he considered withdrawing the army to try to find a more favorable position. According to American sources, Cochrane angrily retorted that if the army was going to shirk its duty, his sailors and marines would and the army could bring up the baggage. There is no British source for these famous exchange. Would Cochrane of talked so to a brother and law of Wellington and a well respected officer ? Cochrane had the temperament to do so, especially if he felt the booty of New Orleans might slip from his grasp. They knew peace negotiations were going on at that moment and the army was already exhausted. He ordered guns brought up, which destroyed the Carolina on the 27th. With this menace out of the way, Pakenham reorganized his army into two brigades. Gibbs commanded the right with the 1st Indian, 44th, 4th and 21st. Keane commanded the 85th, 93rd and the 95th. On the evening of the 27th they advanced and occupied the Bienvenu and Chalmette plantations. his actions in the Peninsular War and the Caribbean. 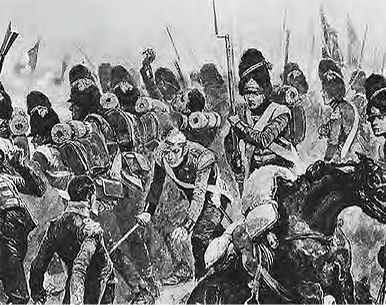 Personally brave, he often led his troops in the thick of battle, such as this scene at Salamanca. Ironically, he opposed the war with the U.S.
On the morning of the 28th, the right column, under General Gibbs, took post near the skirts of the morass, throwing out skirmishers half way across the plain, whilst the left column drew up upon the road covered by the rifle corps which, in extended order, met the skirmishers from the other. Drums set the pace and bugles sounded across the plain. The spectacle of the British advance was splendid in the extreme. "Forward they came," says the author of "Jackson and New Orleans," "in solid columns, as compact and orderly as if on parade, under cover of a shower of rockets and a continual fire from their artillery in front and their batteries on the levee. It was certainly a bold and imposing demonstration, for such as we are told by British officers, it was intended to be. To new soldiers like the Americans, fresh from civic and peaceful pursuits, who had never witnessed any scenes of real warfare it was certainly a formidable display of military power and discipline. Those veterans moved as steadily and closely together as if marching in review instead of 'in the cannon's mouth.' Their muskets catching the rays of the morning sun nearly blinded the beholder with their brightness, whilst their gay and various uniforms, red, gray, green and tartan. When they got within 600 yards, the American batteries opened up, supported by the Louisiana. One single shot fired from it killed 15British soldiers. It fired over 800 shot for 7 hours .The British faced withering gun and cannon fire. The consequence was that in half an hour two the British field-pieces and one field-mortar were dismounted, many of the gunners were killed and the rest, after an ineffectual attempt to silence the fire of the shipping, were obliged to retire. "In the meantime the infantry, having formed line, advanced under a heavy discharge of round and grape-shot till they were checked by the appearance of the canal. Of its depth they were of course ignorant and to attempt its passage without having ascertained whether it could be forded might have been productive of fatal consequence. A halt was accordingly ordered and the men were commanded to shelter themselves as well as they could from the enemy's fire. For this purpose they were hurried into a wet ditch of sufficient depth to cover the knees where leaning forward they concealed themselves behind some high rushes which grew upon its brink and thus escaped any bullets which fell around them in all directions. All thought of attacking was for this day abandoned and it now only remained to withdraw the troops from their present perilous situation with as little loss as possible. This cost General Pakenham a loss of 59 killed and wounded. The casualties of the American side were nine killed and eight wounded. At the extreme left of Jackson's lines, a mile away from the river where the ditch could be leaped and the embankment easily surmounted, there was a moment which rightly improved what might have given a different issue to the day. Upon getting sight of the rude line of defense, General Gibbs, instead of ordering the "simultaneous rush," which would have carried them, was obliged to remember that the affair was only a reconnaissance, and so halted his eager column. A detachment under Colonel Rennie advanced, however, drove in the American outposts, and drew up in a sheltered position one hundred yards from General Carroll's division. Carroll's men clamoring for a share in the day's work, their General permitted Colonel Henderson to lead a column of two hundred Tennesseans along the borders of the swamp, with the design of getting to the rear of Rennie's detachment and cutting it off. The attempt failed. A body of British troops concealed in the woods, opened fire upon the column, killed Colonel Henderson and five of his men,wounded a few more, and compelled the rest to retreat behind the lines in confusion. At this moment, when Rennie, elated by the result, was advancing on Carroll's division and about to close with it, an imperative order from General Gibbs obliged him to retire. It is beyond question that a vigorous attack upon the left at that time would have given General Jackson more serious trouble than he had yet experienced during the campaign. The British lost 152 killed, wounded or captured, the Americans seven killed. After the battle, Pakenham asked Cochrane to create some diversions in Lake Ponchartrain and at the mouth of the Mississippi, which Cochrane did. Jackson did divert some forces to these locations. Jackson brought in some heavy naval guns from the Carolina, increasing the number of batteries from four to eight. The British kept in a constant state of anxiety and agitation. Sending down small bodies of riflemen, the American general harassed our pickets, killed and wounded a few of the sentinels and prevented the main body from obtaining any sound or refreshing sleep. While two European armies remain inactively facing each other, the outposts of neither are molested .This action was considered ungentlemanly by the British and breaking an unspoken rule of warfare between civilized countries and greatly annoyed the British. "In these little 'hunting parties' Jugeat's Choctaws naturally excelled. One of them, a half-breed named Poindexter, being authentically credited with the killing of five British pickets in three nights. The British reported that more than fifty British soldiers were killed, and many more severely wounded by this method of assassination. Pakenham sent Jackson a letter deploring the activity. To which Jackson replied that they were defending their homeland and would employ an measure necessary to do so. these attacks continued until the British departed New Orleans on Jan 18.